iger, at the crossroads between the Maghreb and Black Africa, is a melting pot of races and ethnic groups. A landlocked country with seven neighbors: Algeria and Libya to the north; Benin and Nigeria to the south; Chad to the east; and Burkina Faso and Mali to the west, its size it is more than 5 times the area of the United Kingdom. Roughly two thirds of the country is desert. 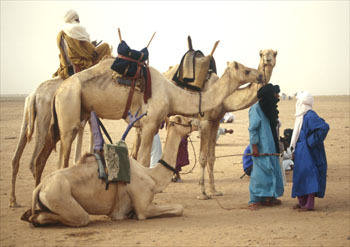 In the north the mountain range of the Air region has low rainfall, but sufficient to support the cattle-rearing Tuareg. Further south, the country changes from semi-desert to savannah. Close to the border with Nigeria, Hausa farmers are able to cultivate groundnuts and millet. The majority of the population is concentrated in the south-west corner of the country where the main crops are grown: Millet, sorghum, maize, tomatoes, onions, potatoes and rice, and cattle and sheep are reared. In fact, Niger is quite sparsely populated, the total population being around 8 million, and is made up mainly of nomadic Tuareg and Peulh (Woodabe) as well as the more settled Hausa, Zarma and Kanuri peoples. 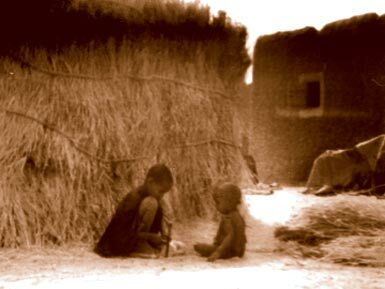 The official language is French and the commonly spoken languages are Hausa, Djerma and Tamasheq (Tuareg). aving climbed down from the truck, we shook the fine sand from our clothes, stretched our stiff limbs and when the dust of the parting truck had settled, we looked around. The village we had chosen for the start of our desert adventure consisted of one-storied mud houses, the main street a wide sand track with narrower passages forking off at right angles. Half-naked kids played soccer amid great laughter and shouting with a ball made up of old cotton scraps. Young women in colorful attire busily went their way, many carrying a tiny baby tied to their backs and one or two toddlers in trail, while carefully balancing water jugs for their family's needs on their heads. A group of turbaned and veiled Tuareg braves, swords in red leather scabbards dangling at their sides, walked by at a leisurely pace. Right in the middle of the road, oblivious of all that went on around him, a middle-aged fellow stood in deep concentration, hunting for lice in the waistband of his cotton trousers. he first thing we needed to find in Ingal were lodgings. Asking the owner of a small shop selling bread and dates about a place to rent, some two hours later we were able to move into a little house, consisting of two rooms and a walled-in small yard. The building, as all others in Ingal, was built of yellowish adobe; healthy to live in, cool during the days and warm in the evenings. Next we had to buy the necessary minimum of household utensils, mainly two cooking pots, some spoons and bowls made of calabash gourds, a knife, a few enameled Chinese tin plates with their typical colorful flower designs, a water jug and a broom. To be able to cook our meals we also needed a basic stock of provisions, consisting mainly of rice, couscous, pasta, dried tomatoes and dates, sold out of big sacks at the tiny grocery shop on Ingal's main road. hile Ingal's inhabitants were generally friendly, it soon was evident that they usually expected a "cadeau", a present, for any real or imagined assistance. Being new to West Africa, this really put us off; we never had encountered such avarice in Asia or the Middle East. can't remember many details about our quarters; what I'll never forget though is the toilet, a small chamber built from mud bricks like everything in the village. In the middle of the dirt floor there was a square hole measuring about 20 cm on each side. In this room, a weird occurrence took place: Every evening at the same time the whole population of giant cockroaches living inside the toilet hole crawled out of the opening and consequently started to climb the walls. After clearing the floor, the lot would stay together at the same height but spread out over all four walls and very slowly move upwards with the passing hours. Visiting the loo around maybe 8 o'clock, one would encounter them all sitting nearly motionless at some 30 cm from floor level. Going back two hours later, they'd have moved up another 10 inches or so, until after a few hours time they'd be right under the ceiling. Having reached the apex of their daily excursion, they'd start to descend again at the same very slow speed, until next morning not a single one was to be seen. During the day, not a single cockroach would venture out of their hiding place. Now as long as the roaches were up on the walls, no problem. What made us feel uneasy though was the possibility of squatting right over the hole the moment the critters chose to start their daily ascent. Imagine them crawling all over your feet and maybe even starting to climb your legs. Eeechhh! I've had to share my rooms with cockroaches (and worse) often on my travels, but never have I seen those insects behave in such a weird way. Usually they just scurry about everywhere at night, each on its own, and at a good speed. Nowhere else did I see this strange spectacle of those roaches' slow nightly ascent and subsequent descent. As to the purpose of that ritual, I have no clue. It wasn't about food, that much is for sure. There was more than enough of that inside the toilet cavity, while the plain walls were bare of anything edible. I had to file this away as yet another one of life's unsolvable mysteries. For a shower, there was a walled cubicle where water could be splashed over the body by means of a small jug, a technique common to Asia, Africa and South America, and probably to a lot more places where tap water isn't prevalent. The used water ran out into the street through a small hole in the wall at floor level. etting acquainted with the village, it's infrastructure and its inhabitants took up our first few days. People in the streets visibly were of different ethnic groups, and within a few days we had learnt to tell them apart; as each group looked noticeably different: The actual villagers were mostly negroid Songhai, the men dressed in wide robes, the women wearing colourful cotton dresses, usually carrying their youngest baby tied to their backs. Far more fascinating were the rather bizarre looking folks squatting in groups on the market square. Some of the men wore animal skins tied around their middle and coned hats fashioned of leather and straw, while the women had their ears adorned with dozens of huge metal rings and wore their hair in a rather elaborate style. Those gentle nomadic herders of the Fulani ethnic group are called Bororo or Peulh; alternately they are known as Woodabe. They make up only about 2% of Niger's population. Proud, aloof Tuareg men, their heads and faces up to the eyes hidden by turban cloth, looked very mysterious if not outright romantic. 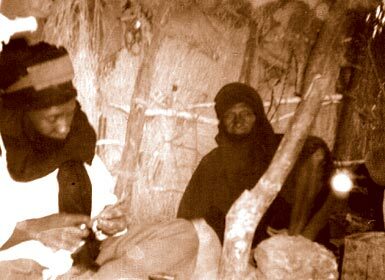 Same as the Peulh, the Tuareg came into town, if a village consisting of mud houses can be called as a such, for shopping or business, but lived in their tents out in the desert. e had been looking forward to meeting the Tuareg, the famous "blue men", with great anticipation. Actually, they were a big disappointment. Their aloof, proud looks had misled us to believe them to be an indication of equally noble traits of character. That assumption was a clear miss; all the Tuareg we were to meet in Niger were in no way less greedy and materialistic than any other tribes. The only exception were the Peulh or Fulani, those never bothered us with the inevitable "Ou est mon cadeau?" (where is my present? ), they always were relaxed and in a bantering mood, and much less concerned with material matters than their compatriots. Unfortunately, we didn't have the chance to really get acquainted with any of the Peulh. They seemingly only spoke their own language, so any attempt at communication was reduced to a few gestures and smiles. What I remember most vivid though was the visibly pleasant disposition and the lighthearted laughter of those truly unspoiled children of the Sahel. 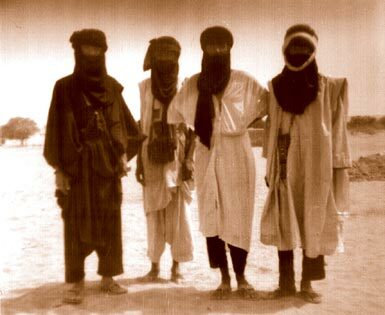 With the Tuareg we could communicate at least on a very basic level, using a few French words and some scraps of Arabic, the latter being often understood by elders versed in reading the Quran. uareg women wear massive, heavy silver jewelry of a type I loved at first sight. In our second week at Ingal, I had myself a pair of big earrings made by the silversmith on the photo above. 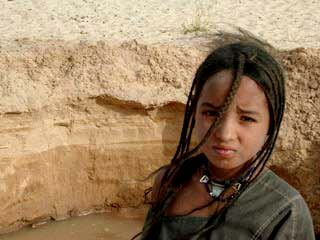 Big, that is, by western standard; by Tuareg standard, earrings of such small size are worn by little girls only. 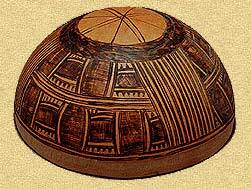 Those for adult women were about three inches in diameter, and as thick as a young girl's finger. It was a bit hard in the beginning to fit the rings through the holes in my ears, but once those had adjusted to the new size, the earrings were very comfortable to wear. Additionally I got me a thick, solid silver bangle in the same style made. The following year I brought the earrings to a Cairo silver smith who made me an exact copy of better quality silver; those I was to wear day and night for many years to come; those are still in my possession. Later, when my baby daughter was sitting in my lap trying to stand up, she'd use them as handholds to pull herself up with. Sounds bad, but actually, due to earrings thickness it didn't hurt at all. 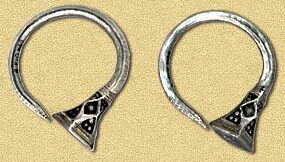 Other pieces of Tuareg jewelry encountered in Niger are the various "crosses". Those are amulets worn around the neck, and each place has its unique shape and design. I have lost my Ingal cross many years ago, but still have the Zinder one. or those items not available at Ingal, we had to go to the small town of Agadez, 20 km away. 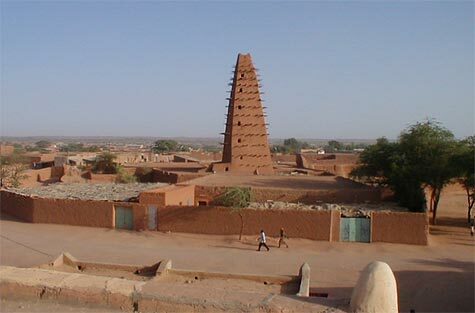 Founded by the 11th century, Agadez developed because of its location on trans-Saharan caravan routes linking Egypt and Libya with the Lake Chad area. 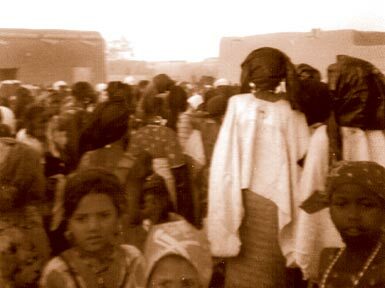 Agadez remained a trade center until the late 19th century. During much of this time it was a center of Islamic learning as well. The French occupied the town in the early 20th century. Mines of tin, tungsten, uranium and salt are found nearby. 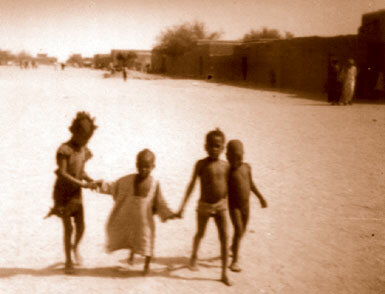 At Agadez evidently a few more foreigners had passed through than at Ingal. One, a Swiss explorer, writer and photographer by the name of René Gardi (1909 - 2000), well known to me from the radio of my childhood days, definitely had left his mark: Grinning street urchins astonished us with expressions like "René Gardi isch guet" and "Chuchichäschtli". The later means "kitchen cupboard"; a word near to impossible for non-Swiss to pronounce. Swiss travelers generally consider it great fun to teach it to the locals wherever they go. 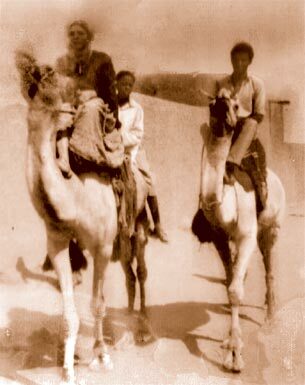 s soon as we had bought the camels (see next chapter for details), our daily routine was to ride them every morning for a few hours. Though often Ahlemin, the boy we paid to teach us what we needed to know about our new travel mates, didn't appear until lunch time. He usually had some excuse ready, like he had to look after his smaller brother or some similar story. Incidentally, nothing ever prevented his being present around noon, when lunch was ready. There never was an agreement about us feeding the boy, he came of his own will to share our meals. Of course he was welcome. Ahlemin's appetite was enormous, he always wolfed down at least two heaped plates of food. While eating, he never got tired of complaining how he didn't like our food, and how the millet his mother prepared was so much more to his taste than my rice or couscous. Millet being the common staple in the region, he plainly wasn't used to eating anything else. As much as we probably were to him, Ahlemin was a source of constant irritation to us. When X presented the boy with a nice traditional men's shirt from Nepal, he looked at it with disdain, proclaiming it to be a woman's garment. Later we saw his small brother wearing it, the shirt came down to his ankles. When I drew a map of the world for Ahlemin to show him the locations of some of the world's countries, the boy wasn't in the least impressed with my efforts. He didn't more than glance at my drawing, immediately turned the paper round and drew France and Belgium. Those were the countries his food came from, all else was of no interest to him. In those years of the drought, the people of Ingal lived mainly of foreign aid. Trucks regularly brought staples like millet and milk powder, which got distributed among the populace according to the village headmen's directions. Ahlemin was a truly ignorant fellow, and as he continued to turn up only for meals but never when he was needed for work, we soon dismissed him and employed another boy named Ahmed. hmed was younger than Ahlemin, he was only about twelve years old, yet he was very intelligent and conscientious, and we took an instant liking to him. He seemingly to us as well, because one day he told us that his parents were long dead, he was living with an uncle who didn't treat him well, and that he would like to stay with us. We explained to him that we wouldn't stay in Africa forever, but would some day go back to Europe and later again to places like India and Nepal. No problem, that was fine with him, said he. We seriously considered taking the boy along and adopting him, so he could later leave Niger with us; we even went to the village head with our proposal and got his consent. But Ahmed's uncle had a say in the matter as well, and that was a very definite "no way". ome 80% of Niger's population are Muslims, though it is a rather unorthodox brand of Islam, mixed with local animist and voodoo traditions. To our consternation, most that we knew about the religion from our stays in Arabian countries and Pakistan didn't apply. On Islamic holidays, the village women stayed up all night long, dancing tireless and with abandon, until sunrise. They'd dance in big circles, clapping their hands, many of them with a tiny baby tied to their backs. For hours the dancers would stomp and sway with the beat of the drums, their babies' little heads flying up and down, up and down. No wonder Africans have such a great feeling for rhythm! reparing for our journey, we needed to buy various items like leather bags: smaller ones for tobacco and the like, bigger ones for our clothes. 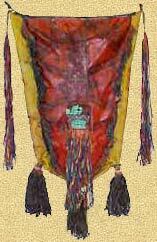 All bags were beautifully colored, painted with Tuareg designs and decorated with many tassels. We also purchased two intricate brass Tuareg locks to close our bags with and safeguard our possessions. For myself I bought a beautiful knife, its hilt inlaid with patterns fashioned from different metals and engraved with the smith's name and location in Tamashek on the back, to wear under my skirts, on my leg right below the knee. Not that I really deemed it necessary to wear a weapon; rather the dagger had caught my fancy and it was a romantic idea to wear it in that way. Of far greater importance were 4 goatskins to carry our water provisions. Every single article we bought was genuine; tourists in this part of Niger were not numerous enough for it to be worth while to produce souvenir junk. 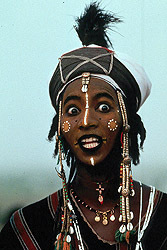 uareg are also called "Blue Men". That name is derived from the fact that they like to wear garments made from cloth dyed so heavily with indigo to give off enough excess color for the skin of the wearer to take on a distinct blue tinge. No question, we had to have such garments as well. To our dismay, the best indigo cloth, looking somewhat like carbon paper, was far too expensive for our budget. We had to settle for a lower quality, and after our clothes were sewn and we could wear them, our skin kept that blue tinge only for about a week or two. Furthermore, to look and feel genuine, X needed a sword. It would have been futile to carry one without knowing how to use it, so he arranged for a young Tuareg fellow to teach him. It was fun watching the two men practicing their moves. is training completed, X never again left the house without his sword in its leather scabbard at his side. He also wore it on the day he got into a fight with some fresh teenager from Agadez, the next bigger town. The cheeky young fellow had made some insulting remark to X, who, mean tempered as usual, replied with a slap in the face of the offender. The youth now pulled on the hilt of X's sword. 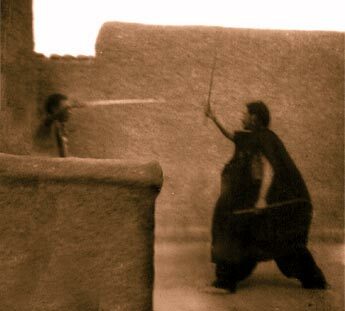 X, trying to prevent the loss of his badge of manhood, held on to it and in a matter of a few seconds his antagonist had pulled the blade right through the flesh of X's fingers. The sword was freshly sharpened, and the tips of three fingers were cut halfway through, bleeding heavily unto the sand. The youth fled, while we hurried to the village dispensary, a small shack at the outskirts of Ingal, as fast as we could; X gripping his injured and bloody hand with its partially severed finger tips. Luckily some nurse was in attendance and immediately started to apply stitches to close the gashes. Too many nerves were damaged though, and those three fingertips never got their full sensitivity back. I was somewhat in shock as well, but in the back of my mind a pleasant glow of satisfaction was spreading, because for once my violent spouse had gotten his due. His injury didn't help to improve his temper over the next week or so. ordering the market square stood a few stalls selling food. Stall meaning four poles stuck into the sand covered with a tattered piece of cloth against the glaring sun. The vendors sat on the ground, the bowls and calabashes containing their wares lined up in front of them. One favorite snack were orange-sized balls of dried millet meal, crushed in a calabash bowl and mixed with milk and sugar. The resulting thick liquid didn't have much taste, but was palatable enough and a welcome treat. I became a frequent customer of a voluptuous, middle aged lady selling delicious chunks of yam root cooked in a yummy sauce. One day, on passing for another helping of her stew, I noticed a second person sitting on the ground under the awning with the vendor. Getting nearer, I made out an elderly fellow right behind the fat Mama who owned the stall. In front of the owner sat the customary bowl containing the yam, while at her side was a second bowl of about the same size. Squatting in the shade and starting on my portion of yam, I noticed the old man doing something to the woman's back. It took me a while to comprehend: While she was busily stirring her yams, the old man pressed a hollowed out cow's horn to her skin, then sucked forcefully on the other, small end of the horn, and quickly closed the opening with a piece of used chewing gum. After a few minutes, he removed the gum, took off the horn and emptied its content, consisting of lumps of clotted blood, into the second bowl filled with ashes. The procedure was repeated over and over on fresh parts of the skin of her back. With morbid fascination I watched the uncommon sight while eating my plate of yam. n our second week at Ingal we made a lucky find: On the village's outskirts, we happened upon a small, hedged in patch of sandy soil with a few dozen scraggly cannabis plants. Not in a position to be choosy, we happily arranged for a bagful from the garden's owner; if the stuff wasn't of an exciting quality, at least it was dirt cheap. owadays, Ingal, Agadez and the surroundings are the goal of hundreds of tourists regularly descending on the region for the summer festivals of the Woodabe (also called Peulh or Fulani ) and Tuareg nomads, mainly the Cure Salée. 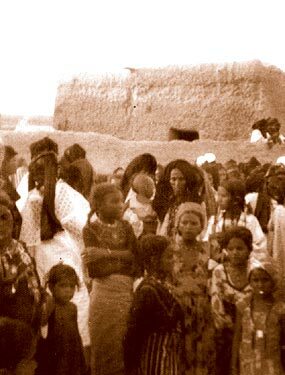 The Cure Salée is actually celebrated by both the Tuareg and Woodabe people as a sort of homecoming after their migrations far to the south during the dry season. 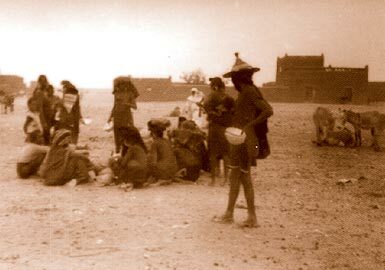 They gather near Ingal because of the rich salt deposits there to rest, fatten their animals, give them the "salt cure," and enjoy each other's company through music, dancing, and frequently camel racing. The Woodabe manifestation of the Cure Salée is called the Gerewol and includes male "beauty pageants," where the young men adorn themselves with jewelry and makeup to accentuate the Woodabe ideals of beauty - long slender bodies, bright white teeth and eyes, and straight hair. Standing in a circle, singing a chant/song, and swaying to the music, the men seek to impress the onlooking young women and be chosen, sometimes for the night, sometimes for life. 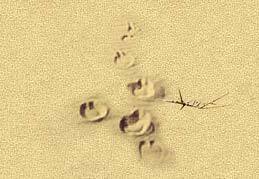 Recently discovered dinosaur fossils also helped to make the region a popular destination. 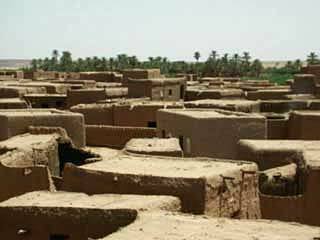 I'm glad I had the opportunity to visit the Ténéré region before big scale tourism set in. Surely today I wouldn't even recognize some of the places I've passed through in '74.